Abstract: Have you ever wondered how a heatsink manufacturer tests its new heatsinks to ensure what you buy will do the job? Have you ever wondered how a heatsink manufacturer tests its new heatsinks to ensure what you buy will do the job? Each processor manufacturer lays out specific maximum temperature thresholds, desired running temperature ranges, and preferred C/W ratings for the type of heatsink employed. It's up to the thermal solutions manufacturer to make sure that its products meet those requirements, and that's where thermal testing comes in. AMD and Intel each do it a little bit differently, and the methods of each respective microprocessor manufacturer change with each successive CPU class. It's rare for any heatsink manufacturer to show off the test platform used for validating prototype heatsinks, but at a recent trade show in Taipei, FrostyTech was shown one such platform for Intel Pentium 4 LGA775 (socket T) heatsinks. The thermal test platform was based on the Intel Thermal and Mechanical Design Guidelines as documented in this technical white paper. The tools consisted of an Intel 'TGRVP MTB' motherboard for testing keep-out areas and heat simulation, and a thermocouple wired chassis for evaluating socket 775 heatsinks under real world operating conditions. FrostyTech has always tested heatsinks based on the concept of a Synthetic Temperature Test Platform which allows us to apply a repeatable heat load, and draw comparisons based on the subsequent rise above ambient temperature. The applied heat loads are manageable from one heatsink to the next by ensuring that input power remains consistent. All things being equal, the only other variable aside from Thermal Interface Material (TIM) application is the heatsink (in simplified terms). Based on that assumption, we can provide comparative results that help you select the most appropriate heatsink for your own computing needs. Testing a heatsink with an actual CPU is perhaps preferable in several respects to some, because the uneven heating characteristics of a CPU die are what you'll actually find in the system. It's an extremely costly and unpredictable method once 'loading & stressing software' enters into the mix though. The Thermal and Mechanical Design Guidelines for Intel Pentium 4 90nm Processors in the 775-Land LGA Package define a different method for acquiring thermal readings from directly above the Pentium 4 CPU core. This is what Intel recommends its manufacturing partners follow, and we can assume what Chipzilla utilizes in its own laboratories too. 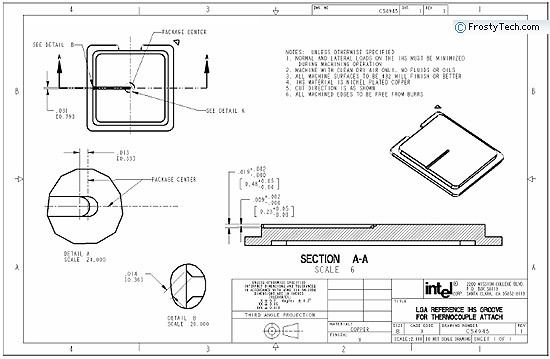 The blueprints for how this is done are shown below. Essentially, the heatsink manufacturer is to mill a very shallow pathway into the surface of the copper Integrated Heat Spreader (IHS) that protects the actual Silicon core of the microprocessor. Subsequently, a very thin wire thermocouple will be epoxy'd into this recess and the surface trimmed down so it is flush and ready for a heatsink to be installed. 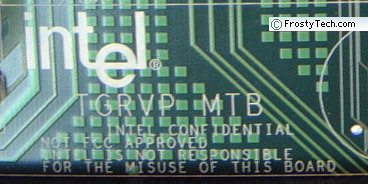 The Intel TMD Guidelines then go on to state how the CPU is prepared for testing, and how thermocouples should be arranged around the intake of a fan to record ambient temperatures, and so forth. Based on the temperature data from each heatsink being tested on the modified CPU, the manufacturer can determine if its spiffy new heatsink design is up to spec, or a pile of scrap metal with little value. 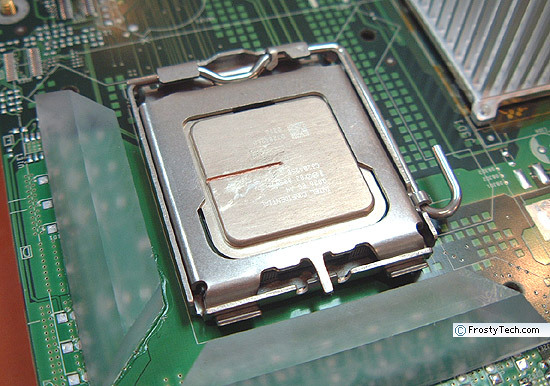 This is the basis with which the Thermal Design Guidelines of a LGA775 Pentium 4 processor can be used to optimize a new heatsink for market by companies like Coolermaster, Thermaltake, or in this case Thermal Integration. Airflow is another part of the whole equation, and the way air enters and exits a heatsink can dramatically influence the overall thermal resistance. From the heatsink manufacturer's position, there is also space and volume limitations to be dealt with. It would be easy to make a heatsink 12" square with an ultra large fan that cools quietly... but it wouldn't fit into your computer nor mine.